Mealtimes are important for any family; they are the perfect time to talk, enjoy a good meal, and make the most of this precious time together. The Keekaroo Café Booster Seat lets your little one sit right up to the table and allows them to feel like part of the family; whether your baby is ready to self-feed at the table or simply enjoys being one of the group, this attractive seat is a great solution. Read on to find out more about the special features that make the Café Booster Seat the best solution for your growing family. The Keekaroo Café Booster Seat is manufactured from pliable foam that holds your child firmly, yet conforms to their body shape, providing comfort while seated at the table; the boosters are designed to fit all standard dining chairs. The raised back offers additional support for children who are old enough to sit on their own. Like all Keekaroo children’s products, the Café booster seat exceeds the safety standards set by the U.S. government. 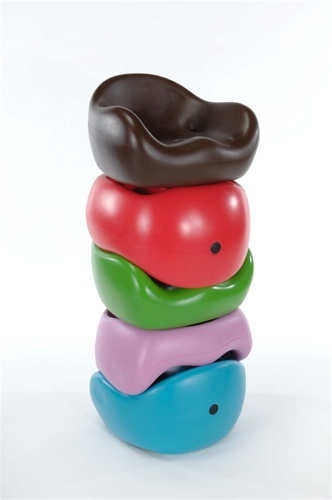 These comfy seats are JPMA certified, ensuring you that your child will be safe and secure at mealtimes. Safety features include a non-skid bottom to prevent slipping, three point safety belt, and straps to secure the booster to any dining room or kitchen chair. Keekaroo’s Café Booster is manufactured of non-toxic materials and is free of latex and other allergens. The anti-microbial surface, with its exclusive peel- and tear-resistant covering, protects your little one from germs, even when the inevitable spills occur. The Café Booster is impermeable to liquids and has a seamless surface, making cleanup easy, even after the messiest spills. Simply sponge away messes with warm water and store until the next time the seat is needed. The Café Booster comes in a variety of colors, including Aqua, Cherry, Chocolate, Key Lime, and Lavender. Their attractive design fits any décor, and the bright colors are appealing for baby. Keekaroo’s Café Booster is manufactured exclusively in the United States. Visit www.akidplace.com and find out everything you need to know about our full line of Keekaroo products, along with baby monitors, toys, furniture, tricycles, and everything else you need for your growing child. This kind of seat are really impressive. I think it is very comfort to seat up and it was made by non toxic materials...WOW!